Thomas Shaw Hellier was born on 25 Oct 1802 the eldest son of James Shaw-Hellier of the Wodehouse. He was baptized in Dudley on 28 Dec 1802. He was the principal beneficiary of his grandfather, Rev Thomas Shaw-Hellier‘s will of 1812. This permitted him to lead the life of an important country squire and landed farmer and pursue his passion for hunting across several counties. He matriculated at Worcester College in Oxford in 1820 (not to be confused with his ecclesiastical Oxford based cousin and exact contemporary also Thomas Shaw-Hellier of Lincoln College). In 1822 he obtained an assistant fellowship at Downing College, Cambridge. Thomas married Alice Titterton Pershouse in London on 3 May 1834. The Pershouses were another significant landowning Stafforshire family and close neighbours at Penn Hall. The marriage only lasted six years before Alice died in Stockwell on 1 Dec 1840. They nonetheless had one son and three daughters. 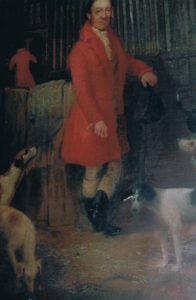 Thomas’s pursuit of his passion for hunting is confirmed by the portrait of him that still hangs in the Wodehouse, where he is surrounded by his hounds. He is recorded as being Master of Fox Hounds and living in Packwood House in Warwickshire around 1838. From Packwood House in 1841 he is recorded as being resident in Harrington Hall in Lincolnshire by the 1851 census. This marks a brief involvement with the South Wold Hunt in this part of Lincolnshire. After this, he moved back to Staffordshire and purchased Rodbaston Hall in 1852 where he was active in the Albrighton Hunt. Both his brother-in-law Richard Evans and Richard’s brother Thomas rode with this important hunt in the period 1840-1859. He is recorded as being a JP for Staffordshire. Thomas Shaw-Hellier died on 7 Nov 1870 at Rodbaston Hall. Winter residence to be in charge of the North Warwickshire Hunt. 1 “Pallots marriage Index gives maiden name as Titterton”.